UK Alpaca’s Lounge Socks are great for lazing around on the sofa, padding about the house and keeping your feet warm in bed. Natural alpaca fibre is breathable, anti-bacterial with good wicking properties that ensure comfy, warm, dry and odour free feet. 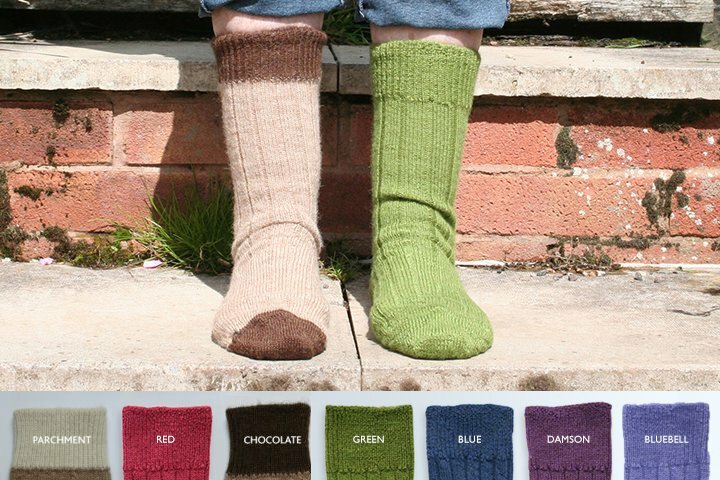 The socks are made from 75% British alpaca and 25% wool and are knitted in Britain. ﾠIn the contrast colour version the main body of the sock is a natural sandstone yarn and the heel, toe and ankle are in a contrasting dyed shade. ﾠAll the alpaca comes from the fleeces of alpacas farmed in the UK.